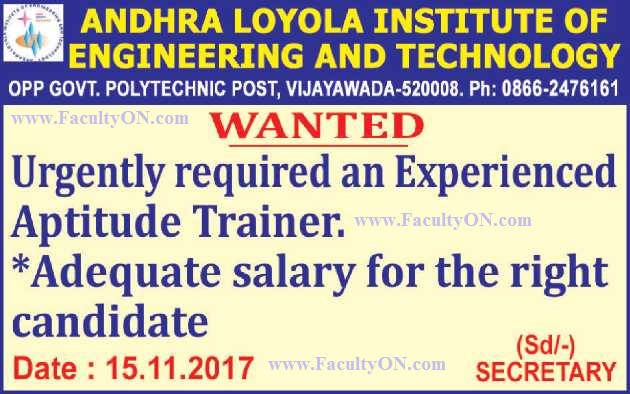 Andhra Loyola Institute of Engineering and Technology, Vijayawada has advertised in THE HINDU Opportunities newspaper for the recruitment of Aptitude Trainer jobs vacancies. Interested and eligible job aspirants are requested to apply immediately from 15th Nov 2017. Check out further more details below. How to Apply: Interested and eligible candidates are requested to send applications along with CV and copies of supporting documents of certificates and experience & PP size photos to the following postal address. Reference: Advertisement on THE HINDU Opportunities newspaper dated 15th Nov 2017.